I have long been a "pre-paid" (pay as you go) cell phone customer and was thrilled to see the arrival of smart phones to pre-paid plans a couple years ago. I initially purchased an Android phone with Virgin Mobile back in the day when Virgin had their $25 per month unlimited plan. That phone became my daughter's phone - yes, I'm a bit of a soft heart... she was soon to head to college and I believed it would be more important to her than to me. Thereafter, Virgin Mobile increased their rates; AT&T offered an Android phone which I purchased and as expressed in my post relating to pre-paid plans, AT&T changed their plan options. Although, I was disappointed by AT&T's behavior in regards to how they rolled out their changes, I have been able to adapt to the plan that they ultimately offered. I highly recommend smart phones and for those who are budget conscious, I highly recommend looking at the Android offerings. While those iPhones may be wonderful, I am not quite comfortable with the idea of such a high priced device being so vulnerable to being lost, damaged or stolen. I love my Android LG Thrive (screen shot below), it does all I need and more in regards to "on the fly" type data and messaging. Google Play and Amazon Appstore - Depending on your device, you likely have one installed but not the other. I recommend both, but note that you may need to search Google on line to determine how to install the other on your device. On my phone, I needed to enable a setting to allow "non-Market apps". Google Play is known to have the latest apps and updates. Amazon Appstore is well known for their free "app of the day" which is as it sounds, a free app that is generally a "for purchase" version. Gmail - I find the Gmail app works betters than the general Email Android app if your email provider is Gmail. It is nice to have your contacts conveniently stored on Gmail so they are available if you happen to be working from a different device - e.g. entered on your cell phone while on the go, but perhaps used later on your iPad when you want to send a message. Google Calendar - I really like that you can create appointments / events and can keep them on your Google Calendar so you can see them on multiple devices - whether your desktop at work, your laptop or iPad. Google Search - No device should be without Google Search! Music - I have a large amount of music - over 8mg which I store on a 16mg SD card. The included Android music app works fine. I enjoy using the Shuffle mode at work. Voice Recorder - I originally overlooked this already installed Android app and it is just like it sounds - a voice recorder. I have found this to be a useful device when I am at work or walking Mick the Wonder Dog and have a brilliant flash of an idea for a blog. The nice thing about this is that you do not need 3g or a Wifi connection - it simply records your voice for playback - so your phone can also be a Dictaphone! Google Voice - Some folks use this to distinguish business calls from personal calls. I use this application as a means to send and receive free text messages. As I have noted in a former post, I have requested that the cell phone provider, AT&T disable the SMS (text) services so that I don't get hit for the $1 per day plus 20 cents per text charges. Google Voice is a great work-around and although this involves creating a different phone number, Google Voice gives you some flexibility in choosing the number so you can easily pick a number that you can easily remember (which might be more useful than your cell carrier). CraigslistNotifica by MLabs - This app provides notifications when items meeting search criteria that I have set appear on Craig's List. I no longer see this app in the Google Play store and cannot find any information to clear up the mystery via Google searches. Regardless, there are other similar apps available and if you enjoy shopping Craig's List, I strongly recommend one of these apps. A quick search in Google Play identified cPro that would provide this function. YeahDawg by Silly Things Utilities ... After the Geico commercial... "time for the weekend... yeah dawg..." This app serves absolutely no purpose other than it always makes me laugh and when things get stuck in the rut, I enjoy running the app and seeing the dog say "yeah dawg". Personal Finance - Wow - This has many great features all in one. For example, you can calculate mortgage payments and run an amortization schedule to see your progress in paying off the mortgage on your house. Additionally, this app does a terrific job with stocks. I am able to see after hours activity regarding stocks, I am also able to customize the view so that I can see things such as the P/E, dividend and yield. ColorNote - What I like about this app is it's simplicity. I have used this app on many occasions to create a list from the Sunday Sale Ads (as I certainly wouldn't remember the bargains on my own). DiskUsage - My (low end) smart phone has very limited space. This app provides a simple visual to identify what is consuming space on my phone. I can also use it to open the individual apps and clear out the data / cache of the app to free up space. BreakTheBlocks - I enjoy this game as it is pretty close to brainless - you don't need to know complex rules, moves or keys - simply hit the ball with the paddle to break the breaks. I obtained this app from Amazon as a free app of the day. Much as I enjoy it, I would not spend $1.99 to purchase it. 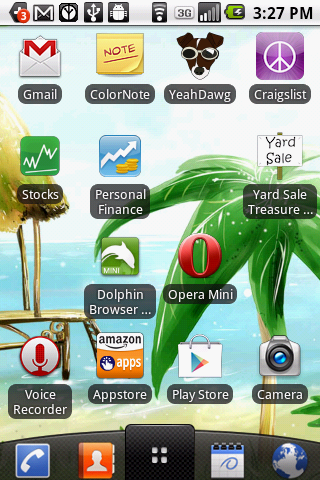 Dolphin Browser Mini - I've tried Opera Mini and have that installed also, but over time, Dolphin is the one that I use regularly. I have commonly used sites, such as the local library and college gym schedule right on the speed dial page for quick reference. Yard Sale Treasure Map - I do like the iPad (iPhone) versions of the garage sale finder apps better, but it is handy to have such an app on your Android phone and this is the best of the bunch that I've found.